A few hundred feet west of north America’s Continential Divide, the fir-and-aspen forest opens to a delightful stretch of sagebrush meadows watered by willow-fringed brooks and creeks and surrounded by the Centennial mountains. This is the Alaska Basin, the eastern terminus of Montana’s fabled Centennial Valley. Roaring Creek Ranch is located on the south of the east corner of the basin close to the divide. The Centennial Valley is one of southwest Montana’s highly protected valleys. Straddling the Idaho border and overlooking the Red Rock Wildlife Refuge the 296± acre ranch offers incredible mountain and valley views. The lower portions of the ranch offer gentle topography, productive grasses and plentiful water that makes for ideal summer grazing for stock and recreating. The upper reaches of the ranch transition to timber covered slopes which lead up large basins and snow covered peaks. The Centennial Valley is one of the last undeveloped places in the West. 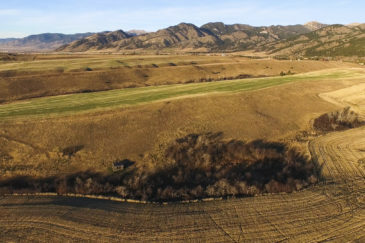 In fact, many ranches in the valley, including the Roaring Creek Ranch, have been protected with conservation easements ensuring the agricultural integrity and wildlife habitat in perpetuity. In addition to being ideal summer grazing for cattle the property is adjacent to public lands which offer excellent hunting for deer, elk, and antelope. Also, the nearby Red Rock Wildlife Refuge offers some of Montana’s best waterfowl hunting during the early season which would be from early October until the lake and surrounding wetlands freeze over. Roaring Creek Ranch - Lima, Montana from Fay Ranches on Vimeo.